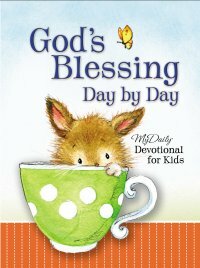 This devotional for kids is very special. Set to span a full year, there are devotions for Monday thru Friday and the weekend. Each devotion is one page. The top lists a Bible verse, the middle explains what the verse means with real life examples, and then there is a prayer at the end. Also, every other page has an adorable illustration of some sort of animal, flower, etc. This hardcover full-cover book is set to last years. I'd say that children of all ages will enjoy it. I am an adult, and I loved reading these devotions before bed at night. This book is Christian, so there are many references to Jesus, as well as New Testament quotations.